Reading through the family cookbook for summer recipes, I was very excited to find a Plum Kuchen recipe from a bookkeeping ledger Grandma Irene used to write recipes in. Kuchen is German for cake and some people use more of a coffee cake batter, but this is made with a yeasted dough. It's not a very sweet cake, so some people prefer to call this dish a tart instead, but that doesn't quite seem to fit either. Kuchen it is! Start to finish, it takes about 2.5 to 3 hours, but most of that time you're just waiting for the dough to rise or the oven to finish working its magic. This is going into my rotation for sure...it feels like a nice treat and it's delicious, but it's not so sweet as to trigger me to keep eating more than I should. For dessert, top with ice cream or sweetened whipped cream, and for breakfast tomorrow I'm gonna put some nice yogurt on it. The traditional plum for this is an Italian prune plum, which is a little more oval than round. Those weren't available at my market this week, so I used a combination of black and green. 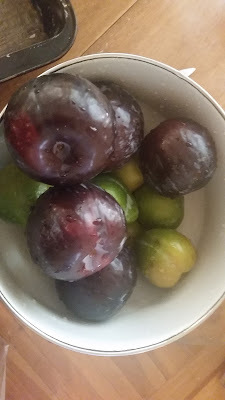 As it turns out, Grandma used to use canned plums in her "Real Plum Kuchen", which I'm sure came in handy in Phoenix in the fifties! 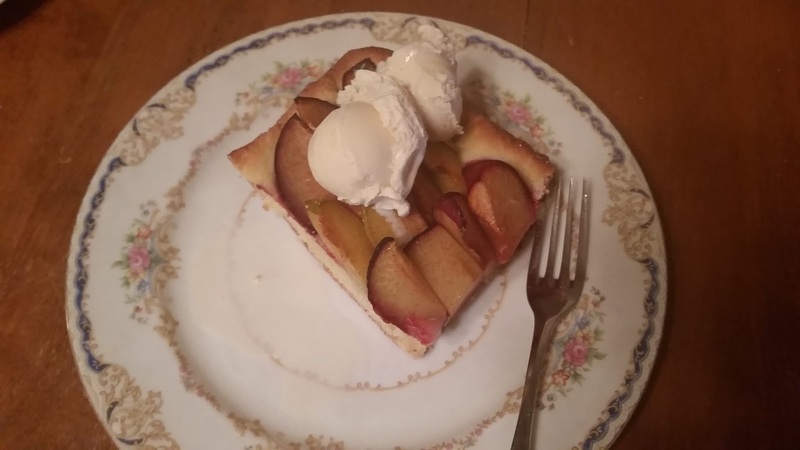 After consulting with Uncle Bill and doing a little internet research, I decided to use her apple kuchen recipe and just put fresh plums in instead. Sprinkling the top wasn't necessary with canned plums, but the cinnamon sugar in the apple recipe was going to do the trick with these tart fresh ones. Recipe from The Way We Ate: Over a Century of Great Food from the Farnbach Family. Wash 7-8 large or a combination of large and small plums, removing any stickers, and set aside. I used 5 of the larger black ones and 5 of the green ones. Warm 1 cup milk, 1/3 cup sugar, 1/3 cup butter, and 1/2 tsp salt, stirring just until the sugar and butter dissolve. Cool to lukewarm. While the milk mixture cools, dissolve 2 tsp instant yeast in 1/4 c lukewarm water. When everything is no more than lukewarm, add the yeast and 2 beaten eggs to the milk mixture. Then add 3 3/4 cups sifted all-purpose flour - I confess, I didn't sift today so I could get out of the hot kitchen faster in this 90 degree weather. Sorry, Grandma! Mix well but don't knead. Put in a bowl, cover with a clean kitchen towel, and let rise for 60 to 90 minutes until about doubled. When the dough is ready, preheat the oven to 350. 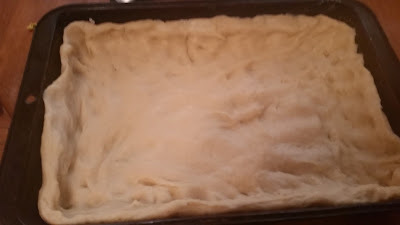 Butter a 9" x 13" baking pan and put the dough in it. Press it out into the corners and up the sides. You can spend a little time making it perfect, but rustic is also good here. I'm sticking to that story. 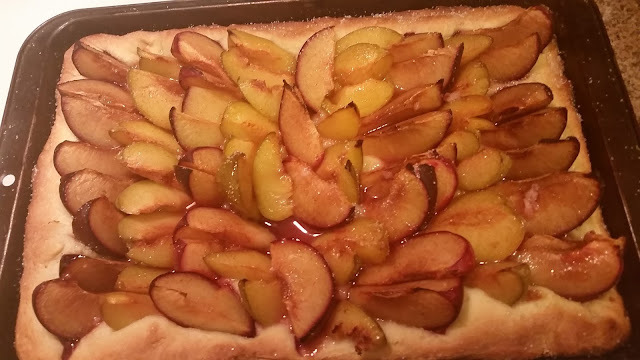 Cut the plums into slices of even thickness and lay them in overlapping rows on the dough. You can lay them down or place them sticking up a bit, but you don't need to peel them. Don't worry if they start to turn a little brown. When the dough is completely covered, mix 1/4 cup sugar and 1/2 tsp cinnamon. 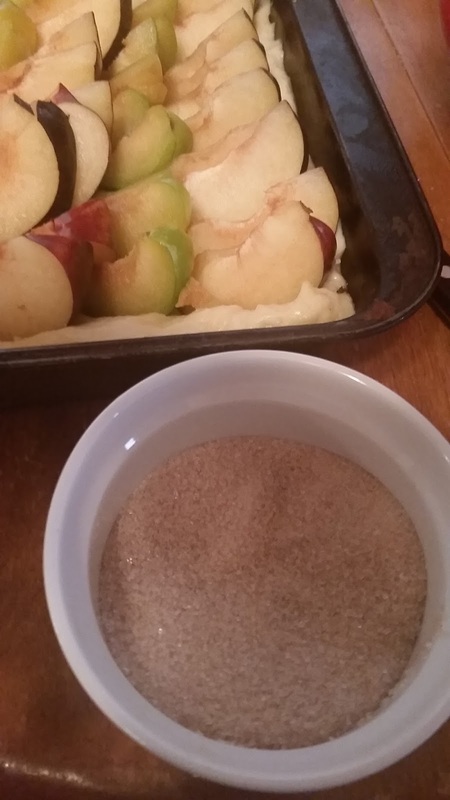 Sprinkle evenly over the plums. You could use a little more or a little less, depending on the sweetness or tartness of the plums. Sprinkling technique: if you use the bowl, it'll dump out in clumps. Put a pinch in your fingers and sprinkle it on from a few inches above the pan. Repeat until done. Bake at 350 for 45 minutes or until the dough is getting golden brown. Sprinkle with a little more sugar and let cool for about 20 minutes before serving.